Here's what you need to know to become a pro in no time. Also, check out our training videos in the Feature Training section of the EasyWorship training page at training.easyworship.com. There are three views you can use. You can access these three views by clicking the view menu at the top of the window. Change the view to "Preview and Live" to make it look more like the older versions of EasyWorship. Preview and live combined allows you to preview whatever is select and go live with it all from the same window. 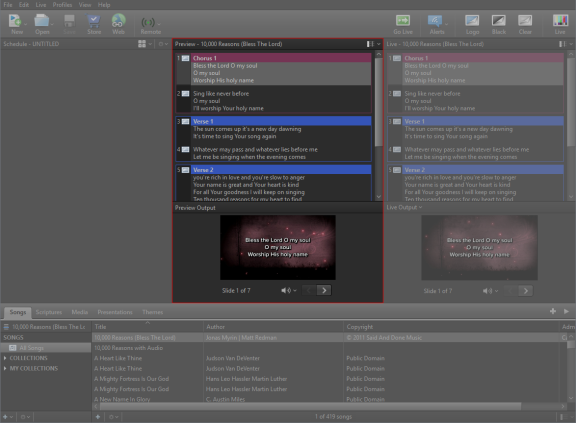 Or, stick with original view for EasyWorship 6 / 7 Live with Resource Preview. The Schedule Area in EasyWorship allows you to build a playlist or "set list" of items you want to present during your worship service (e.g., songs with backgrounds, scriptures, PowerPoint slides for the sermon, live camera feeds, a mini-movie for offering or a sermon illustration, a website, and lots of other options). These articles will introduce you to the basics of how to build your first Schedule, how to edit and re-order the items within the Schedule, and how to save it as a file so that it can be shared with other users. Resource Listing tabs on the left. Resource Library and details in the middle. 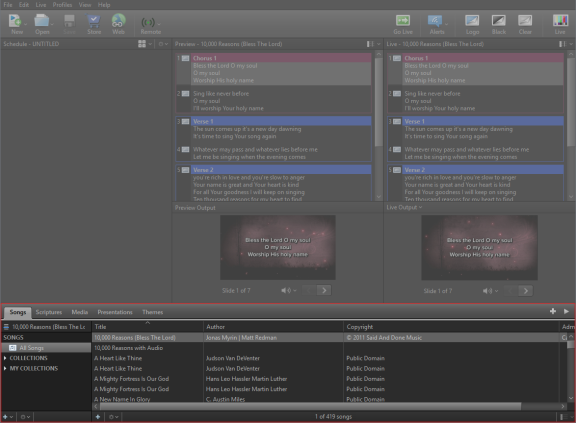 In the Preview and Live Combined and Live with Resource Preview views, the Resource Area has three columns. Compose Area on the right. Additional menu options are in drop-down buttons in the bottom left of the Resource Listing and Resource Library, including Add Item and Action Menu buttons . In the Resource Library, there's an icon view drop-down with a slider that allows you to customize your view for thumbnails or list view . Presentations - Presentations in the Resource Area will house any EasyWorship presentations you build in EasyWorship and PowerPoint slideshows. You’ll have a complete searchable library of presentations at your fingertips. No need to search your hard drive for a PowerPoint file when it’s right there in EasyWorship. The Preview Area displays a preview of the current selection, whether it's a media item in the Resource Area, or an item in the Schedule. You can double-click the item in the Preview Area to send it to the live output immediately. You can also advance through multiple slides in the Preview Areausing the forward and back buttons, but this does not advance them in the live output. The Live Area displays the current live output. You can advance through the slides using the forward and back arrow buttons on screen or by using the Helpful EasyWorship Shortcut Keys. No editing can be done in the Live Area. However, if you are currently on a Logo, Black, or Clear screen, you can double-click a slide in the Live Area to turn that off and resume Live Output. Right click on any song and click edit song or click new and select song from the toolbar. You have the option of viewing slides or text on the left. Type text on the left in the words view or type text in the text box in the preview area on the right. The preview on the right, now has the ability to add more elements to the slide and you get WYSIWYG editing options. To create a new slide press CTRL+ENTER. To break a slide into two slides, put the cursor at the beginning or end of a line and press CTRL+ENTER. There is a designated section of each slide for the slide label. You can use key words or you can type anything you want in the label field. In options you create your own labels with colors. Setting a background can be accomplished by clicking the theme button and clicking on a theme. A different theme can be applied to each slide by dragging a theme on to the slide from the theme dropdown. To modify the theme for this song, click the Masters button at the top to the right of the slides and words tabs. Making changes to the master slide will apply to every slide. Clicking the inspector button at the top right allows you to tailor the formatting to your liking, allowing you to be even more creative. Select a slide element and go to town making changes, including outline, shadow, transparency, even mirror effects. 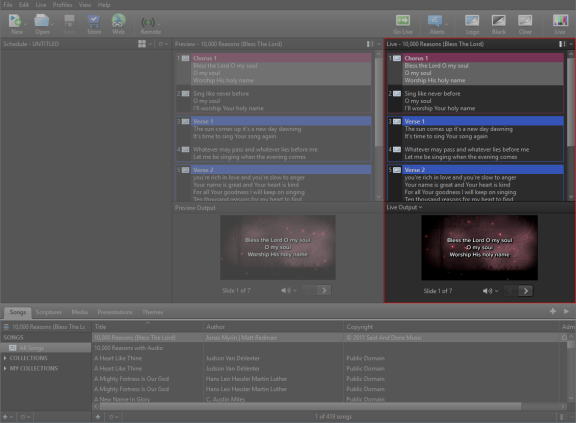 The inspector also allows you to select a background from the media list or select a color / gradient. You may also drag a media item from the media drop-down onto a slide to assign it to that slide as a background. Media items can also be drug into the slides area to create a blank slide with that media item as the background. 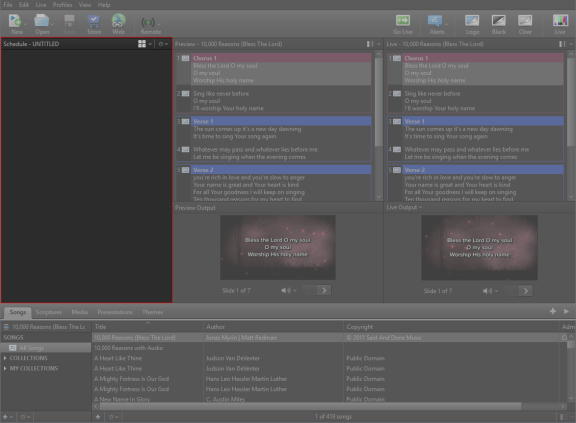 Click on media, right click on one or more media items and click copy to theme, select Song, Scripture or Presentation. Click on Themes, click the plus button at the bottom of themes. Click inspector, then background to set a background, color, gradient, video or image. Modify how the text will appear over this background. Click on the themes tab, Click on Song, Scripture or Presentation, right click on the theme you wish to set as default and click on Set as Song, Scripture or Presentation theme. You can drag and drop a theme onto any slide in a song in the schedule or in the song editor or onto the song itself in the schedule to apply it to the whole song. Create collections based on the criteria you want to use. Use the folder (directory) that media items are stored for criteria in a collection if you set up folders in an older version. Use tagging, title or file name of the media item to create easily accessible lists of media items based on the criteria you provide. The same media item may can appear in multiple collections. Use titles, song words, scripture text to create criteria to load only those items you want to see when clicking on a collection. Search has been expanded to all libraries within the Resource Area with two different search modes.Search by resource title, by scripture reference, or by keyword. Toggle between search modes by clicking the icon on the left side of the search box .